It’s Chili Season! Well, in the southwest, it is always chili season. While I love all the different types of chili, my absolute favorite variety is white chili. If you haven’t had white chili, it is made with white beans, chicken, corn and, of course, lots of chili peppers. You can play around with the ingredients and experiment with using different chili peppers. It is a very forgiving dish. I tend to lean towards making a milder chili that all my children can enjoy. Then I set a bowl of hot peppers on the table for my husband to add to his bowl of chili. When I make chili, I like to make a double or even a triple batch. Then I use the leftovers in Chili Pie, Chili Pasta Bake or Chili Stuffed Potatoes. When I don’t have leftover chili for this recipe. I start by baking the potatoes and while the potatoes are cooking, I quickly pull together the chili ingredients and let it simmer on the stove top while the potatoes finish baking. After baking the potatoes, you scoop out the inside of the potatoes. 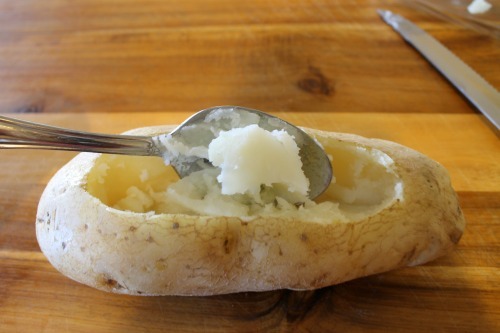 Save the potato and tomorrow night you can use it to make mashed potatoes. Spoon the white chili into the cavity of the potato. Top with cheese, diced peppers or onions. I add diced jalapeno peppers to the top of my husband’s stuffed potato, but add diced red and bell peppers to the top of my kids’ potatoes. Then bake the stuffed potatoes until the cheese melts. Cheater Cooking Tip: I prefer potatoes baked in the over, however, if you are in a hurry, you can bake your potatoes in the microwave instead of the oven. Check your microwave’s manual to see how long to cook them for. Wash the potatoes and prick them with a fork. Bake at 400 degrees for 1 hour. In a large pot, brown chicken, onion, and garlic in the olive oil. Add the chicken broth and cornstarch, whisk until the cornstarch is dissolved. Cook on medium- high heat until it reaches a boil. Cover, lower flame and simmer for 30 minutes. When the potatoes are done, cut an oval out of the top of each potato. Scoop out most of the potato. Spoon chili into the potatoes. Sprinkle with cheese. Place on a baking sheet and bake at 400 for 5 minutes or until cheese melts. 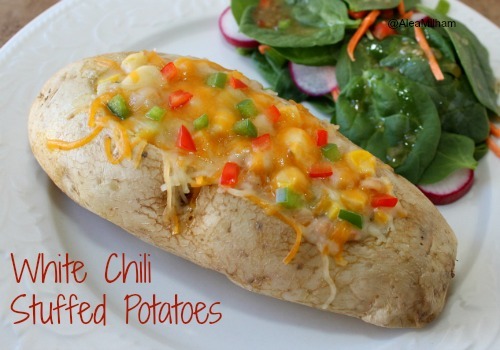 I serve the chili stuffed potatoes with a garden salad. White Chili is my favorite chili, too. 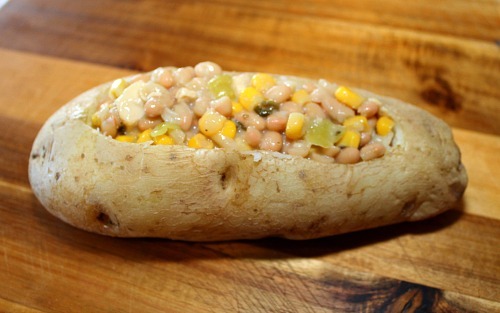 I never thought to put it in baked potatoes, though. Thank you for the great idea!